When it comes to producing quality vape juices, Element e-liquids stand in a league of their own. Based in California on the west coast of the United States, this manufacturer has created a broad range of different blends and juices to ensure that, no matter how you choose to vape, there is an Element e-liquid formulated to suit you. In addition to the Element 50/50 range, we also stock the popular Dripper, NS20, Far, KOI and Emulsions ranges, all available for purchase online and instore today. While known for pushing the envelope in the world of e-liquids and vaping, Element realise that sometimes tradition is a good thing in its own right. 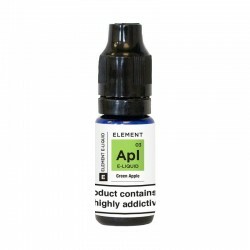 As the name implies, their 50/50 range of e-liquids strikes a balance between vegetable glycerine (VG) and propylene glycol (PG) in its base mix, resulting in juice that is suitable for all, and producing a decent pall of vapour without compromising on the intensity of flavour, or smoothness of draw. 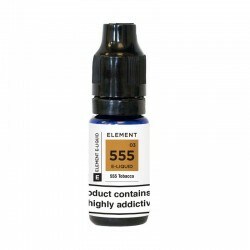 If Element’s 50/50 range can be considered a traditional blend, then the flavours they include in the series are likewise. Eschewing some of the weird and wonderful flavours available across the rest of their ranges, they have settled on the mainstays of vaping – strong, fruity flavours that linger on the tongue and the nose. Flavours like green apple, pineapple, strawberry and Neon Green Slushie. Okay, so there are a few unusual ones on the list too! The 50/50 range of Element e-liquids come as 10ml bottles of pre-mixed juice as standard, and have a wide variety of nicotine strengths to choose from, so getting the right hit for you is simplicity itself. Choose from 3mg, 6mg, 12mg, and 18mg varieties, depending on just how much of a kick you want from your liquid. The Element 50/50 range can be bought today from F&S E-Cig’s online store, where you benefit from fast and efficient delivery, anywhere in the United Kingdom. If you prefer to buy instore, you can visit one of F&S Central London vape shops where we stock a wide range of vaping products including some exclusive lines not available to purchase online.